THE ELECTION OF office-bearers in UMNO’s Women, Youth and Puteri wings just concluded over the weekend. There is another round of election in the coming weekend for the Vice-President posts and Supreme Council seats, while the UMNO General Assembly has been scheduled between 2-7 December 2013. For me, these remain just news items, read in passing. 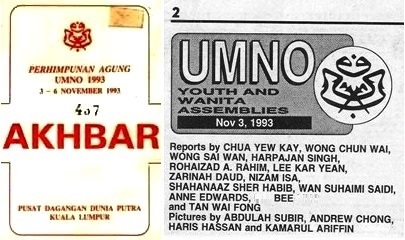 But 20 years ago I was involved in covering the UMNO GA which was held between 3-6 November 1993. I still have the press tag! (L) My press tag; (R) Our team byline. Some of the team members, led by then-Chief Editor Mr. Chua. Two people in this team have since passed on. The Star, Thursday 4 Nov 1993. 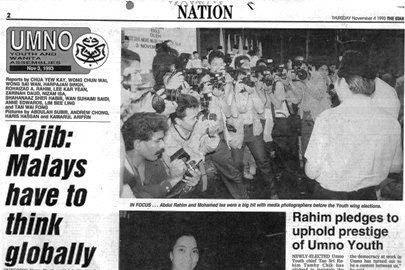 The Star, Friday 5 Nov 1993. This entry was posted in Articles, Star Stint and tagged Articles, Star. Bookmark the permalink.